DESIGN BY ACCIDENT: A card is selected. A packet is dealt into four piles and the top card of each pile matches the selection. ESP PARADOX OF PAIRS: A spectator picks three pairs while you deal the cards. These pairs are the only ones containing two matching symbols. DUAL ESP TEST LOCATION: Two symbols are selected under very fair conditions, yet, you can announce them. TRIPLE MATCH BY DESIGN: A spectator shuffles the deck. You take a prediction card and the spectator finds two more matching symbols. SYMBOL SENSE: A deck of cards is mixed and three spectators think of a card each. You reveal those three cards. The method is fantastic. 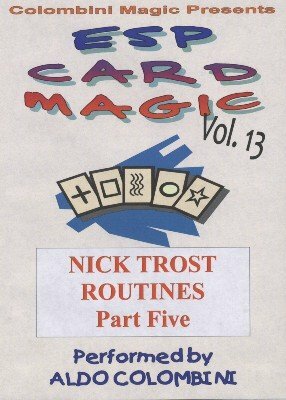 FOUR-TOLD: A unique routine with a deck of 50 ESP cards (two decks combined into one). You lay down four symbols and four spectators pick a symbol each. They match your predictions. THE SYMBOL SEPARATION TEST: Another great routine using two decks of ESP cards. The spectator deals the cards and finds piles of matching symbols. Great and unique effect. TWO-DECK ESP 7-CARD DRAW: You make a prediction leaving seven cards in view. From a shuffled deck a spectator picks seven cards and they match your seven cards. ESP CARDS CONCORDANT: A very strong triple coincidence that finds three matching pairs. SYMBOLOGIC: You have a set of five symbols and the spectator has one as well. You place the cards on the table and the spectator places his on top. The five pairs match!